Frontispiece: The Turtles cling for dear life to a Chinese dragon while Raph describes the different kinds of battles, large and small, and how some of his most important battles have been fought against his brothers. Amid the New York City rooftops, the Madhattan Maulitia, led by Chucky, are chasing an incognito Mikey. Apparently, they have mistaken him for a homeless person trespassing on their "turf" and want to teach him a lesson. Mike is content to run until Chucky whips out a gun. Mike quickly takes them out before any shots can be fired. Back at April and Casey's apartment, the Turtles and Shadow are playing a wholesome game of Monopoly. Mike enters and tells of what happened, spurring the four into yet another argument in regards to where they should move. Raph wants to set up shop in an abandoned church, Don wants to move to North Hampton to be with Splinter, Leo wants to return to the sewers and Mike wants to stay in the apartment. Their fighting eventually upsets Shadow (still a toddler), who begins to cry. They stop arguing and attempt to console her, but are interrupted by a gunshot. Looking out the window, they spot the Maulitia invading an apartment building across the street. Chucky and the Maulitia are shaking down a guy named Cristo, whom they had warned to get off their turf. Before Chucky can gun him down, the Turtles (incognito) burst in through the windows and attack. An eight page-long battle ensues and the Turtles emerge victorious over the Maulitia (naturally). The last one standing, Chucky, breaks out a twin pair of katana and shows off some moves. He throws down with Leo, who takes him out with little effort, though he admits that Chucky was skilled and ponders who might have trained him. The Turtles are then approached by Cristo, weilding a gun, who turns out to be a member of the Purple Dragons. Cristo recalls their encounter with the Turtles in an alley many years ago and wants revenge. Not amused, Leo takes him out and the Turtles return home. Discovering the neighborhood to be more dangerous than they had realized, the Turtles begin arguing once more; determined to come to a conclusion once and for all. Their fighting gets them nowhere and Leo at last decides that they should all just go their seperate ways. This scares some sense into the TMNT, who decide to compromise: they'll keep their room in the apartment, set up bases in the sewer and church and visit Splinter in North Hampton more often. The Turtles join hands in agreement, leading Mikey into a solo of "We Are Family" by Sister Sledge...to nobody's amusement but his own. *This issue also featured a bonus pin-up, "Steam Grate Turtles! ", by Darryl Graham. 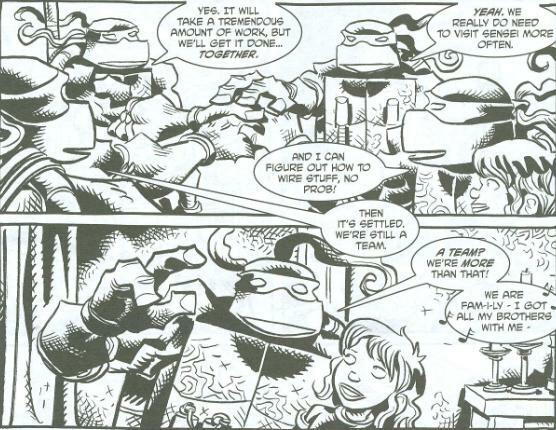 *The Turtles first scoped out each new lair and decided to separate and move into them back in TMNT (Vol. 2) #3. 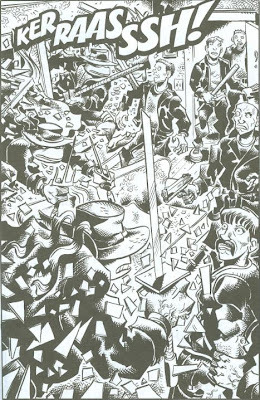 *The Purple Dragons had their infamous alley battle with the TMNT in TMNT Vol. 1 #1. 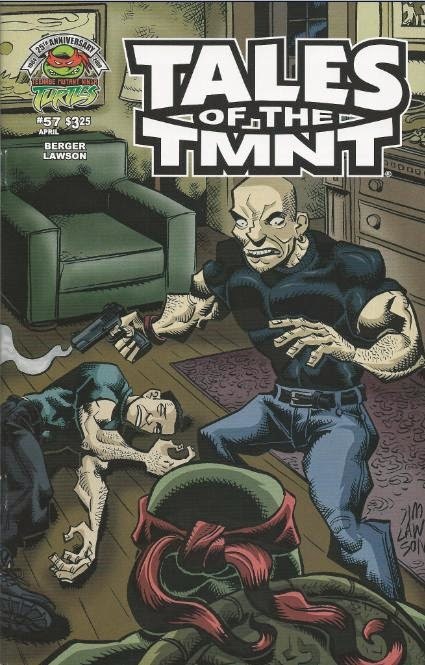 *According to the opening editorial, this story takes place not long after the TMNT returned from Nevada (though Shadow seems to be a few years older than in Vol. 2). *The Turtles will encounter the Madhattan Maulitia again in Tales of the TMNT (Vol. 2) #66, TMNT Vol. 4 #1 and then regularly throughout the rest of that volume. A decent issue, storywise, that leaves me wishing for a proper TMNT comic in a sequential, serial format rather than an anthology take. Stories like this are all too necessary, but lose impact when thrown in a series where all the stories are smattered randomly about the timeline. There was apparently a lot of tension building up to the Turtles' decision, but when you're not reading the series in anything approaching a coherent sequential order, that tension drops dead. That aside, it's a nice look into the private squabbles of the Turtles and fills in a nice little gap in their continuity (when and why did they decided to ditch the apartment and go back to the sewers). Berger turns in an amusing if low-key script, though the eight pages of silent battle sort of screamed "filler" and made for breezey reading. Still, it's a twenty-eight page comic with only two ads to speak of, so you're still getting more content for your buck than from most publishers. Nothing new to say about Lawson's art. You all know how I feel about it by now, anyway. His poor use of line-weight and two-tone inking (that is, black and white with no shades in-between) make for some very muddled fight scenes, sort of defeating the purpose of an impressive eight page brawl. 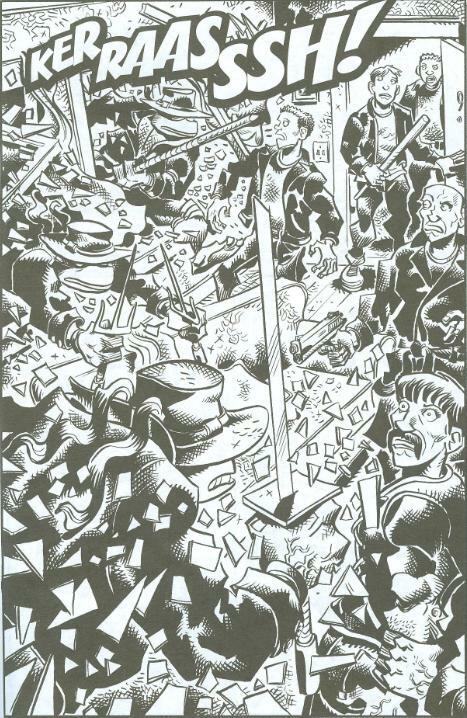 Page 13 is especially difficult to comprehend, with every character garbed in a black jacket (including the TMNT), crammed together in a small apartment with broken glass fluttering everywhere. 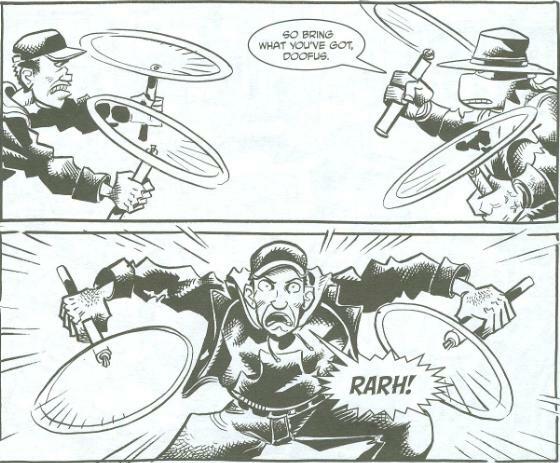 Proper use of line-weight and some better inking would have made that page a lot easier on the eyes; all I'm sayin'. Overall, this was an okay story, but so low-key that you'll probably forget you ever read it by the time the next issue comes out. well, shadow seems kinda amused by mike's singing... you're not thinking about the children! What I find amusing about this issue is that it leads so well into Volume 3, which is supposedly non-canon. In Volume 3, Raph's church is indeed used as one of their headquarters. By the time we get to Volume 4, they have a new sewer lair. So this issue isn't really a bridge from Volume 2 to 4, it's more of a bridge from Volume 2 to 3.